Answer… I’m not sure yet! I’m on tenterhooks waiting to find out if I’ve qualified for the GB Age-Group team for either this year’s World Championships or next year’s European Championships. Although Nottingham Triathlon this year doubles as a qualifier for both, the criteria are complicated; the registration of intent to qualify for each championship is separate; athletes may be pre-qualified for one and not the other; the number of places up for grabs is different for each; the age category for next year’s European champs is calculated based on your age next year, not this year; and then there’s the actual race results, penalties, queries and so on! It’s all a bit weird, as I took quite a lot of convincing by Em to even bother coming up to Nottingham this year, and after the Eton SuperSprint last weekend decided I’d be pleased if I could just match my performance from 2013. 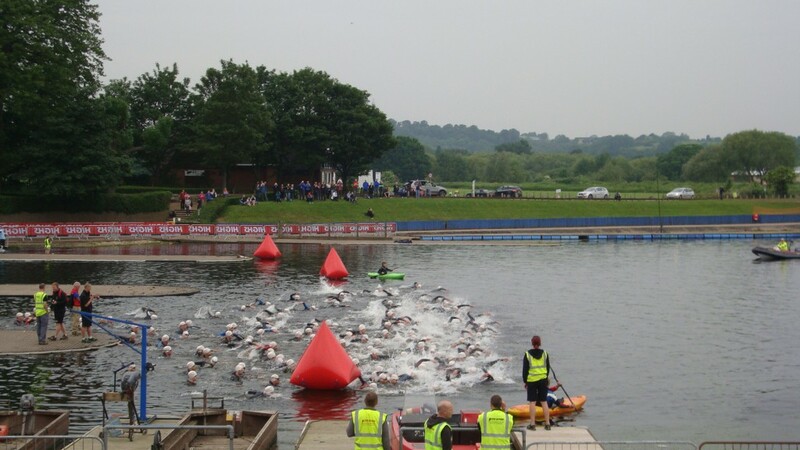 I took four days off training completely this last week, did one last short swim at the Tri2O Swim Centre with a lot of transition practice and then span round the Holme Pierrepont bike course a couple of times when we arrived on Friday afternoon. I made it to race day rested, but it wasn’t exactly what I’d call a taper. When we were allowed down from the boat house roof I was quickly set up across the split transition. I had a bit of a jog, a stretch, and Em helped me into my wetsuit before I joined the 172 other athletes in wave 2 for the race briefing. We made our way into the water and I swam backwards and forwards enough to get rid of the chill. The swim looked like it was going to be as intimidating as last year, with all of us jostling to be in the front row, or planning to swim over the top of those who were, but I decided I’d go for it, but try to stay relaxed and see what happened. When the horn went, everyone went off as hard as expected, but somehow it didn’t seem quite as brutal as a year ago, or maybe I’ve just got used to it! I managed to sight the first buoy successfully when I needed to and draft some feet and hips on the way to it. The crush on the two turn buoys also wasn’t as severe and I think it may have been that I was actually slightly nearer the front of the pack than in 2013. By the time I got close to the exit I was in clear water, just down from a little group ahead of me. Apparently I exited right in front of Garry Walker (European AG champ in 2012, British AG champ in 2013), not that I could tell that at the time, we all look the same in black wetsuits and white swim caps! My split of 10:58 was a big improvement over last year, first job done! I had a reasonable T1, the last minute practice on Thursday and the adjustments I made to my watch position solving the trouble I had at Dorney a week ago. I was quicker than last year, though I still lost a few seconds vs. the best of my age-group. I’d already decided I would push for a PR on the bike, and then just see what I had left for the run. There was a little breeze at our backs on the way up the lake and I was quickly up to 43+km/h. Having ridden the course the afternoon before really helped at the far end as I managed a confident line through the bends, and set off back down the lake. My tweaked position on the bike felt comfortable and I was holding 37+km/h… could I hope to average 40km/h all four laps? It’d be a massive result if so. The second lap went just as well, but come the third one, I was starting to wonder if I’d overcooked it. I tried to relax, stay aero and keep pushing the pedals and started to feel a bit better when I got back to the boat house end to start the final lap. At this point, a pack of ten cyclists or so came steaming past me, and I decided that was my qualification chances gone. 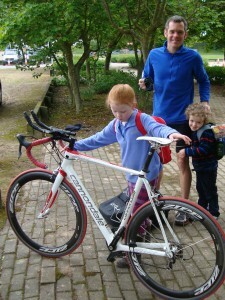 Oddly it was almost relief that I felt, because it freed me up to focus on the bike PR and running my own race. I wasn’t the only one to feel a bit indignant about the blatant drafting though, as Mark Yeoman tweeted “Felt sorry today watching wave 2 at Nottingham sprint World Qualifier. Honest racers out front mowed down by large bike packs.” That is kind of how it felt! The draft buster motorbike was in evidence – with video recording this year, we were told – but it must be very hard for them to decide who to penalize in a group like that. Anyway, before the last two corners I let my legs slack off just a little bit and then spun up the cadence to try to get some life into them ready for the run. I was lucky with my rack position in T2, close to the bike in, so that I was quickly into my week-old Brooks Ravenna 5 (thanks, Sweatshop Reading!) and running the length of transition unencumbered. It’s a narrow start to the run and I had to squeeze past one or two before we clambered up past the dragon boat and up to the big scoreboard before joining the lake circuit. I’m passed by one runner, a younger GB age-grouper, but I can’t stay with his longer stride. My watch buzzes for 1km and I glance at it to see a 3:45 lap… Not the sub-3:40 I’d have liked, but if I could keep that up, maybe I could match my triathlon 5k PR of 18:41. Second km… another 3:45, and only one more runner has come past. Round the end of the lake and onto the home stretch, third km, 3:46, come on! Next is the dog-leg they use to make the distance up to a full 5k, on grass round a tiny hill and my legs were starting to tie up. Heading back onto the lake road I managed to push up my cadence but it didn’t do anything for my pace and the fourth km is a 3:55. Can I hold off the runners behind me? Can I catch anyone in front? I pick it up, and when I pass Em and the kids cheering wildly at 400m to go, she shouts that I’ve got some space… and then I hear a bit of panic… there is a runner gaining. I push on to the finish for a 3:42 final km, an 18:53 split, one second quicker than last year and I’ve held off several chasers in my age-group 5, 8 and 14 seconds back. Not the run PR that I might have hoped for, after doing more running than biking this winter/spring, but maybe a fair result given the huge bike PR. In the finish pen, I thoroughly enjoyed my pint from race sponsor, Erdinger Alkoholfrei. It wasn’t until quite a bit later after an icecream with Em and the kids, that I printed off my results and discovered I’d got 6th place. So a better swim, better transitions, the PR on the bike (39.9km/h) and still one second faster than last year on the run… Over two-and-a-half minutes quicker overall. I’m not sure I deserved it to go that well. If I qualify for the GB Age-Group team for Edmonton this year, or Geneva in 2015, that’ll be awesome, though like many I have no idea how I’d afford to go to Canada! This entry was posted in Bike, Races, Run, Swim and tagged GB Age-Group Team, Race report by garethsb. Bookmark the permalink. 2014 Edmonton ITU Sprint Distance Triathlon World Championships “Gareth Sylvester Bradley, Q3 Notts.” Woo! Well done mate. It’s amazing what you can do if you learn to banish the negative thoughts during the race and just focus on your own race. I used to get really hung up when people passed me on the bike but that doesn’t seem to happen too often anymore. It does on the run though and I find it really helps to just focus on your own PB. So happy to hear that you qualified for Edmonton. Let’s hope you get Geneva too! Thanks, Andy. Turns out the wrinkles in the qualification criteria have come into play for the European champs. Although I was third fastest registered 35-39 year old, there were two registered 34 year olds who were quicker making me second fastest non-qualifier. That might have put me in a good position for a roll-down place having finished in 104.14% of the AG winner’s time, but no, it turns out the blazingly fast Carl Shaw, who won the race overall by 2 minutes from the second placed athlete, is also 34, thus giving me 109.77%, and that will almost certainly be bettered at the other qualification races. Complicated, no? Means I really do need help to find cheap flights to Canada for 29 August!! Great report and a fantastic race by the sound of it. Not looked at splits for your other AGs but guessing you could not have improved much on swim and marginal gains on transitions, bike and run? Would also be interesting to know how many of the AGs ahead of you have coaches? I could still do with sharpening my transitions by 5-10 seconds each, and I’d like to have run closer to my PR. I can improve on the swim and the bike too, but I think I produced close to my single sport bests on those… so basically it’s just more and better training then!